If you want to talk about getting a lot of rock for your dollar, the Meat Loaf and Tom Petty and the Heartbreakers show on November 13, 1977 at the Tomorrow Club was one of those deals of a lifetime. For the price of $3 in advance and $4 at the door, your ticket granted you access to two multi-platinum artists (maybe not yet, but they would be). Meat Loaf was just starting a tour to support Bat Out Of Hell released in October of 1977. It would take a while to garner momentum, but it went on to sell 14 million albums in the United States and millions more worldwide before it was all said and done. Tom Petty and his band were still supporting their first album released a year earlier. Even at this young stage in their careers, though, the Heartbreakers had the hits “American Girl” and “Breakdown” in their repertoire. As promised, here’s another annual list of shows at the Tomorrow Club. This one is from 1977. There’s a bunch of stuff from August missing, but other than that it’s pretty complete. Quality of acts really starts to pick up toward the end of the year with shows from bands such as Rush, Tom Petty and the Heartbreakers, Meat Loaf and Cheap Trick. P.S. These lists take a lot of time. I’m going to continue doing them, but it may take a few months before the next one (probably 1978) is finished. I know Herbie Hancock had very little to do with rock music in 1977, but the guy would become well-known the world over for his video for the hip-hop influenced “Rockit” in 1983. 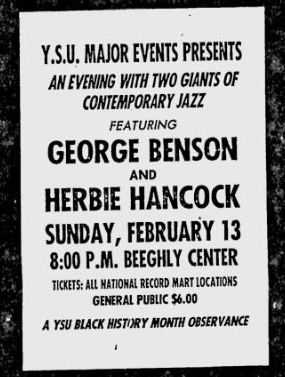 At his February 13, 1977 show at the Beeghly Center he would play with fellow jazz great George Benson. Although AC/DC formed in 1974, it took three years before the band got around to touring the United States. In the summer of 1977, the band hit the club and theater circuit here in support of the Let There Be Rock album. Let There Be Rock was the first of the band’s albums to be made available for purchase in the United States. Several Australian-only releases (High Voltage, TNT and Dirty Deeds Done Dirt Cheap) preceded this one, yet the band was not playing a lot of the songs that would later become concert staples (most notably “Dirty Deeds” and “TNT”) on this tour. The stop in Youngstown on August, 21, 1977 at the Tomorrow Club was the 18th date on the summer tour. The CBGB’s house band from 1975 to ’77 Mink Deville was actually given top billing in the ads that ran in the Vindicator in the days before the show. AC/DC, made up of Bon Scott, Angus Young, Malcolm Young Phil Rudd and Cliff Williams, probably played a very brief set which included the songs “Live Wire”, “She’s Got Balls”, “Problem Child”, “The Jack”, “High Voltage”, “Baby Please Don’t Go” and “Rocker”. AC/DC would graduate to playing arenas the next year and would release three more albums with Bon Scott on vocals before his death on February 19, 1980. WHAT THE SHOW SOUNDED LIKE: The very next day, WMMS recorded the concert at the Cleveland Agora. It was later released as the bootleg Burning Balls.